A22TMT | Training from the BACK of the Room! 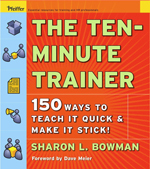 This is the favorite train-the-trainer resource of Scrum and Agile coaches and trainers around the world. Contains a wealth of practical and useful design and delivery tools for any kind of instruction. Explore how the human brain REALLY learns and get dozens of brain-based instructional strategies you can use with any topic and any group of learners. Click on the book cover for more details on Amazon. Your Guide-on-the-Side: Sharon L. Bowman, M.A.